What Day Of The Week Is June 19? 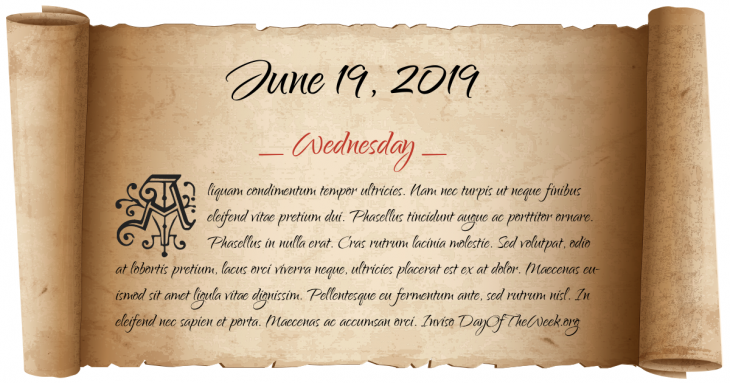 June 19, 2019 is the 170th day of the year 2019 in the Gregorian calendar. There are 195 days remaining until the end of the year. The day of the week is Wednesday. The first officially recorded, organized baseball match is played under Alexander Cartwright’s rules on Hoboken, New Jersey’s Elysian Fields with the New York Base Ball Club defeating the Knickerbockers 23-1. Cartwright umpired. Maximilian I of the Mexican Empire is executed by a firing squad in Querétaro, Querétaro. Who were born on June 19?